It's the longest day of the year. This means it's the most likely day of the year that Jen and I will be able to eat dinner while there is still daylight. This ended up being 8:30 PM but there was a decent amount of sun and bird chirping to make dinner a novel experience. Sometimes when I am caught between the crunch of cleaning out the fridge and receiving a random assortment of vegetables from the farm share I like to do things I'd normally avoid. Firstly this gives me an opportunity to clean the fridge, pantry, and freezer. Secondly it gives me an opportunity to see if certain flavor combinations are avoided because no one has ever thought of them or because they've been tried and are terrible. It's usually the latter. This salad is a key example of this philosophy. 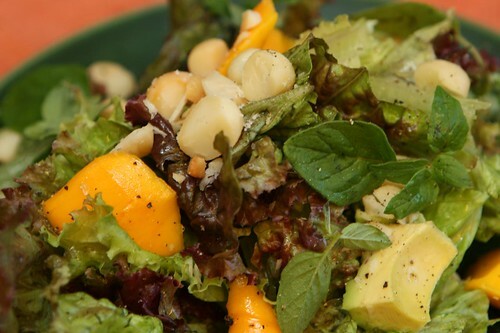 I used some remaining Red Sail lettuce, sliced avocado, crushed macadamia nuts, and oregano leaves as the base of this salad. I could have just left the oregano out but I wanted to see how oregano goes with tropical fruit. As of today a Google search for "oregano and avocado recipes" only yields one result. There will be at least two after today. To tie the oregano in (slightly) I used some lemon juice over the salad along with salt and pepper. I intended on using olive oil too but I forgot and it turned out pretty good even without the oil. 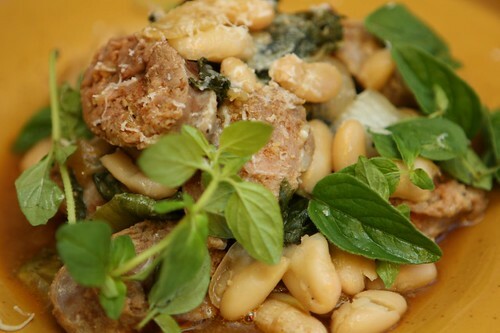 Jen bought some linguiça the other day so I browned up the links along with some onion and crushed garlic then tossed in the escarole from the farm share with some cannellini beans and finished it with some grated Parmigiano-Reggiano. Another day, another hefeweizen. 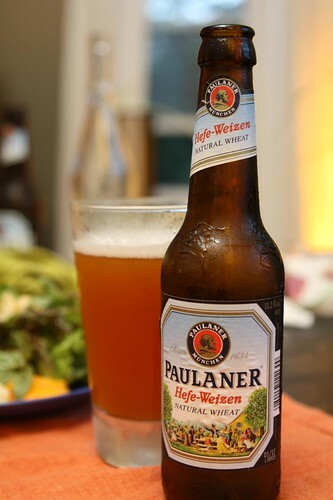 I chose the Paulaner Hefe-Weissbier Naturtrüb from Paulaner as tonight's beer. With a weird tropical-Italian salad and an Italian-Portuguese main course I thought the right thing to do was to go with a German beer. When I'm feeling confused about themes in a meal I always go with Germany. It brings me comfort. And what better type of beer to have on the first official day of summer than a hefeweizen? Now it's time to officially enter my least favorite season of the year! If it wasn't for the Tour de France and grilling I think I might just go into hibernation. Labels: beer, How'd we use it?